With today's movie-making technology, the Power Rangers series deserved to be reignited on the big screen. Not only did the Power Rangers look real in costume, but they looked even better when they were in combat. Some of you probably didn't grow up watching the Power Rangers on TV, but that shouldn't stop you from seeing this flick because you will still have fun. However, if you are not a fan of superhero movies or didn't enjoy the Power Rangers on TV, you probably won't like this flick as much. But if you like superhero movies this is something you need to see. This story takes place in a town called Angel Grove and we meet 5 high school teenagers who have made some poor choices in their lives. By some chance, they unearth an ancient power from a previous generation of Power Rangers and they become the new Power Rangers of the present. Now they must learn to work together to stop the evil that awaits them. 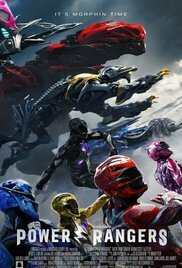 The leader of the Power Rangers is the Red Ranger Jason (Dacre Montgomery), followed by the Pink Ranger Kimberly (Naomi Scott), Blue Ranger Billy (RJ Cyler), Black Ranger Zack (Ludi Lin) and Yellow Ranger (Becky G.). Together they are trained by Zordon (Bryan Cranston) and Alpha 5 (Bill Hader) to go up against the evil Rita Repulsa (Elizabeth Banks). This was a fun time, and I felt like the flick delivered the classic Power Rangers I grew up with. I liked the introduction of the 5 rangers and the way their personal stories were told, which made the flick more realistic. There were some cheesy moments, but I enjoyed the story and perhaps would like to see a sequel. Again, this flick is not for everyone but if you are into superheroes and Power Rangers mixed with a great up-and-coming cast then go have fun and watch this flick. Go Go Power Rangers!